Entry filed under: AAQI News, Miscellaneous Musings. The goldfish is easy, but you have to be a pretty serious West Wing fan to get the flamingo reference! If you had a link to the movie, I didn’t see it. Can you tell us how to find this movie? I checked Google but didn’t come up with anything. IMDB said it was a “documentary short” running about 5 minutes. Is it rentable…from where? You can’t rent it. Click the link in my blog to see it online. I’d love to do one! Wow – what a moving video! I thought I held the record for watching “West Wing” reruns. How about goldfish in one quilt and a flamingo in the other? Which one are you making?Could I do the other one? I’d love to have an “Allison Janney” autograph. I could display the quilt at our Shawnee Quilters show in Harrah’s (only 7 miles from Paducah) on April 20-21-22 along with about the other AAQI quilts we will be donating after our show. IWhere do we go to see “the Captain”? Ami, I would love to make a Priotity quilt with Allison’s signature! I too loved West Wing, and while C.J. was one of my favorite characters on the show, I definitely lusted after Rob Lowe. Allison was in close proximity to Rob all the time…I’m sure that’s a six degrees of seperation thing, too. (;-). I would make a beautiful quilt worthy of har signature. No flamingos, no gold fish. how beautiful, kudos to all involved. and yes tissues were needed.. I have been thinking about doing a quilt ever since my Husband went home to the Lord. After the long years of alzheimers there seem so many memories and deciding on what I want has been a daunting task for me. We had 54 years together and how can you separate what would speak your heart. I want to leave this to my children, grand children and great grand children as a rememberance of their Father, Grandfather, and Great Grandfather. I would be honored to have one of the signature blocks to add to my quilt. I am just in the planning, designing stage now but hope in the coming year to get the blocks done. Thank you for this wonderful site and the support of so many who have been in my shoes. May God Bless You. I’d love to have one of the squares and promise to make a quilt sooner!! And it would be from Las Vegas – but not the one in Nevada – the real, original Las Vegas here in New Mexico…. i don’t know what that has to do with West Wing or the movie but it would be unique and from a most interesting little city. Not too many bright lights or naked women here but lots of sun and blue skies. Geez, I sound like a promo for the tourist industry. Anyway, it would have a southwest flare and in memory of my dad who had Alzheimers. 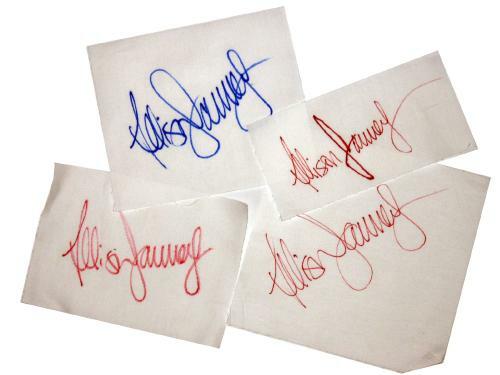 I would love to do a Prioity Quilt with one of Allison Janney’s signatures. I was so sad to see West Wing end. if you still have a siggie left, i would love to make a priority quilt. i have seen every episode with my DH many times. I love West Wing as well and love Allison’s character! I love strong women who can stand in a crowd of men and not look wimpy…also, I think she is so pretty. As a history teacher I loved the references in the show to past events that often times went over the average person’s head….I would love her autograph in a West Wing quilt….you are so fortunate…and you have such a talented dog as well…..
Ami, thank you so much for sharing The Captain with your community! We fell in love with this film the first time we saw it and we’re so glad you have helped in passing it along for others to experience. And what a GREAT idea involving Allison in to the Priority: Alzheimer’s Quilt! If any of your readers want to see more of The Captain, they can visit http://www.poetryspeaks.com/thecaptain. Tweet it, Facebook it, share it with the world. And we have many more audio and video poems at the site as well. Take a look and experience something new. Thanks again, Ami! Ami, this is AWESOME! As a teacher and graduate student I will use The Captain in so many ways. Thank you for the perfectly timed example of how visual messages can enrich textual messages – I am sharing it with my classmates in my Visual Literacy class. I found it easily but after 3 tries I could not get it to go past the middle – it stops like it is done… Any suggestions because I would love to see the rest of it…I have always loved this poem for reality and inspiration. I really have no idea. Try another browser? Restart your computer? Isn’t the woman in the bleachers the actress who played one of the assistants on West Wing? I don’t remember her name, so it doesn’t matter that I couldn’t make out the credits. Yes, she played CJ’s assitant, Carol. Good eye!